It was 150 years ago this month—February 24, 1864, to be exact—that Andersonville Prison first took in captured Union soldiers. Over the next 14 months, 12,699 men died there, close to one-third of the prisoners to pass through its gates. In memory of those who died and those who survived—including my great-great-grandfather, William Davies–I am here reposting one of the entries I wrote last year, after my visit to Andersonville National Historic Site in rural Georgia. My ancestor’s diary reported on troop movements and letters from home, but he avoided writing down the horrifying details of prison life. Therefore, I turned to other diaries, such as the one written by Connecticut POW Robert Kellogg, who indicates that it was raining the day my great-great-grandfather arrived at the open-air stockade that was Andersonville Prison. For the small sum of two dollars in [Federal] greenbacks we purchased eight small saplings…These we bent and made fast in the ground and covering them with our blankets, made a tent with an oval roof, about 13 feet long. They had to lie on the bare ground, with no other covering, but they felt the shelter from weather was more important. On June 1, it began to rain and continued for three weeks, according to Kellogg. 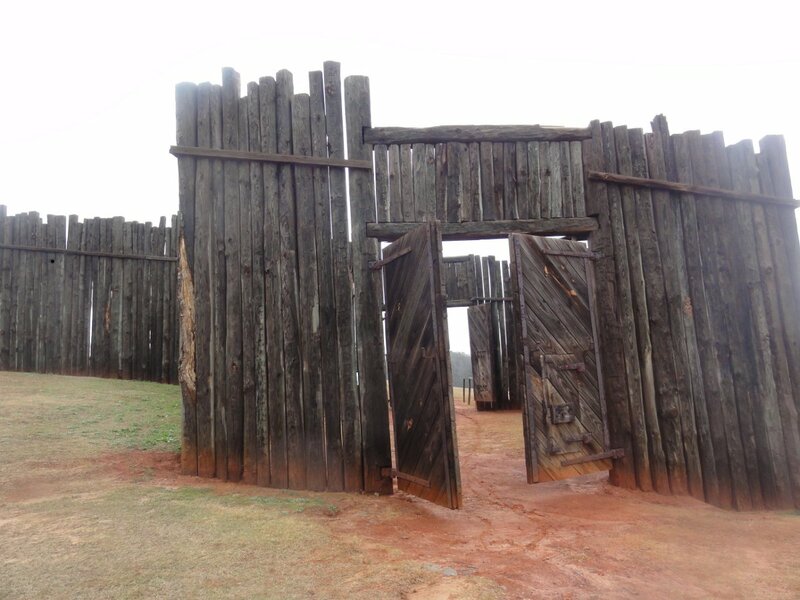 As I stood in the holding pen between the outer and inner doors of the prison’s reconstructed North Gate, I tried to imagine how Davies, my ancestor, might have felt as he stood in the rain on June 21, 1864, crushed against other Union soldiers, waiting for his first sight of the inside of the camp. Had rumors about Andersonville reached him? Did he know what to expect? Certainly he could hear the shouts of arguing men and the moans of the dying. He could smell the reek of the “sinks”, or latrine, which backed up into the swamp that bordered the prison’s only water source at the time, a three-foot-wide stream. I walked through the gate and out onto the treeless hillside, covered with brown grass on this February morning. The land sloped gently down to the stream that crossed the camp from west to east, its banks no longer swampy due to extensive drainage ditches. Another hillside rose from the other side of the stream to the white markers that traced the outline of the former stockade. Several photos were taken of the camp in 1864 by A. J. Riddle, who was documenting prisons for the Confederate government. I tried to superimpose those pictures over the bleak, blank landscape before me. I imagined the land teeming with men, over 1000 inhabitants per acre, some men with shelters and some without. The shelters reconstructed in a corner of the prison site are disturbing to look at. Most of them are lean-to’s or crude tents, narrow and low to the ground, barely big enough to cover a man lying down with his legs curled up. I hope Davies did not have to rely on such a structure for shelter. Perhaps, like Kellogg, he pooled resources with a group of friends. In spring of 1863, Davies’ diary mentioned “the Welsh Squad,” a group from Company A of the 95th Ohio Infantry Regiment, consisting of “T. Humphrey, myself, John Jones, S. Gales and Evan Evans,” all of them Welsh immigrants. Jones died of pneumonia that fall. Davies, Gales, and Evans, along with Ohio native Wakeman Bell, shared a tent at a camp outside of Memphis in the spring of 1864. All four of these men are listed in the database of Andersonville prisoners at the POW museum located near the prison site. None of the 19 captives from Company A perished in the prison. It helped that they were only imprisoned for three months, unlike men who were transferred to Andersonville from other prisons. But I like to imagine that the comradeship of the Welsh Squad helped them survive. For the sequel to this entry, see A Survivor of Andersonville and the Sultana. This entry was posted in Civil War, history and tagged ancestors, Andersonville, Civil War, Post-Traumatic Stress, prison, prisoner of war, Union army. Bookmark the permalink.